Reading is wonderful because it introduces your children to ideas, experiences and concepts that they might not get otherwise. It provides fuel for the imagination and the seeds of new ideas. My children have rarely been to the doctor, except for a couple of emergency room visits. As a result, they seldom, if ever, play doctor. (Which isn’t suprising, children play what they see, their mimickers). We received a shipment of books from UPS two days ago (always exciting!) 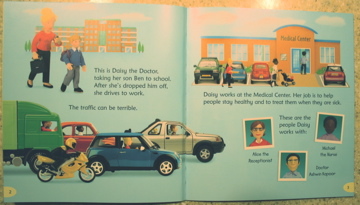 and in it was Daisy the Doctor from the Jobs People Do Series at Usborne. My husband read it to them last night as the went to bed. 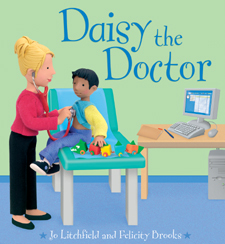 It’s a simple story about Daisy Flowers and her day as a doctor. Reading is a powerful way to stretch minds and expand realities- the purpose of education. Imagination is what drives invention, creation and progress. Without dreamers with imagination we might still be driving horse drawn carriages and sending letters by mail. Our children need to be dreamers and doers. Let them recieve as many ideas in their mind as possible. Introduce them to a wide array of concepts, thoughts and notions. Then their imagination will run wild with the endless conceivable combinations and possibilities. They will be the ones who create an even better future. So let’s introduce our children to the world they live in through live experiences and through reading about the experiences of others, and then let’s let them dream and imagine an even better world. Extensive research has proven that reading aloud to a child is the single most important factor in raising a reader. These inexpensive fifteen minutes a day are the best-kept secret in education. 80 percent of college faculty members report that entering freshman cannot read well enough to do college work. Literacy rates in many countries is 80-90%, unfortunately these numbers are skewed- literacy being defined as the ability to write your name and read a simple sentence. The benefits of having a reading world- where people are interested in reading and make it a life-long pursuit- are unmeasurable. Reading is the heart of education and learning. Every subject flows from reading. Reading is the ultimate weapon against ignorance, poverty, despair, hate, and crime. A nation that doesn’t read much, doesn’t know very much. And a nation that doesn’t know very much is more likely to make poor choices, to exhibit prejudice and hate, to act out in violence, to live in a perpetual cycle of poverty, crime and ignorance. It is clear then that increasing literacy (not the ability to read and write, but the desire and implementation of reading) and creating lifetime readers, is the greatest tool we have for solving the world’s problems. A world of readers is a world of big thinkers, innovators, problem solvers, peacemakers. People who are readers are people who can start and grow businesses, get better employment, solve problems, make more money and improve as individuals. As individuals improve, communities improve. As communities improve, nations improve. As nations improve, the world improves. The challenge then is in creating a world population that is more interested in carrying books than in carrying guns, a population that isn’t just able to read, but wants to read and actually does it, and has access to the resources to do it (books). Develop the habit of reading as an individual. The more you read, the better you get at it; the better you get at it, the more you like it; the more you like it, the more you do it. Promote a love of reading in the next generation. This is done by simply reading aloud to the children in your life for at least 15 minutes a day. Reading aloud has been proven to create a positive association with reading in the minds of children, thus creating a life long desire to read. Help provide the necessary resources (books) to those who don’t have access to them. Many impoverished people do not have the money to buy books or access to public libraries. Read-Aloud.org is committed to getting the best books into the hands of the poorest people, those who need them the most. Take these simple steps towards making world changes. Read every day, and read to your children everyday.